The AC71B is a digital clamp multimeter with two additional unique features: AutoTect™ and automatic backlight. TheAutoTect™ feature automatically senses what type of measurement is being made when the test leads are placed across a measurement point. There is no knob to turn. The meter knows what is being measured and the digital display shows the measured value along with the associated unit icon. AutoTect™ also utilizes alower input impedance. This helps determine if voltage is from leakage (ghost voltages) or a hard connection. Any ghost voltages will be zeroed out by the lower input impedance. The automatic backlight has a sensor that recognizes when the ambient light becomes dim and turns itself on. A bright blue backlight then becomes available. 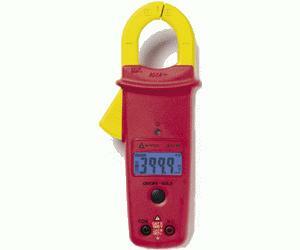 The AC71B is a complete multimeter measuring AC and DC volts, resistance, and continuity in addition to AC current. A useful tool for the electrician, plant maintenance, HVAC or field service technician.